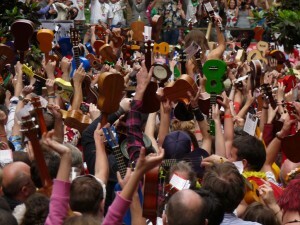 2012 Ukulele Festivals: All around the world! Honk if you love the uke. You’re not alone! The ukulele revolution is taking the world by storm! We just can’t get enough of that powerful little instrument. The ukulele is originally from the South Pacific, but it is loved, played and celebrated all over the world. There are new festivals every year, from England to Thailand to America. Some are just a small gathering of people, sharing their love of the uke. Others are weekend-long parties, with lessons and ukulele-making workshops along with concerts and uke jams.